Thanksgiving is officially just a week away and I really wanted to up my appetizer game this year. While I know that cheese and crackers aren't the most healthy thing that you could serve as an appetizer, it definitely has its place and time. Holidays and special celebrations happen to one of them for me! 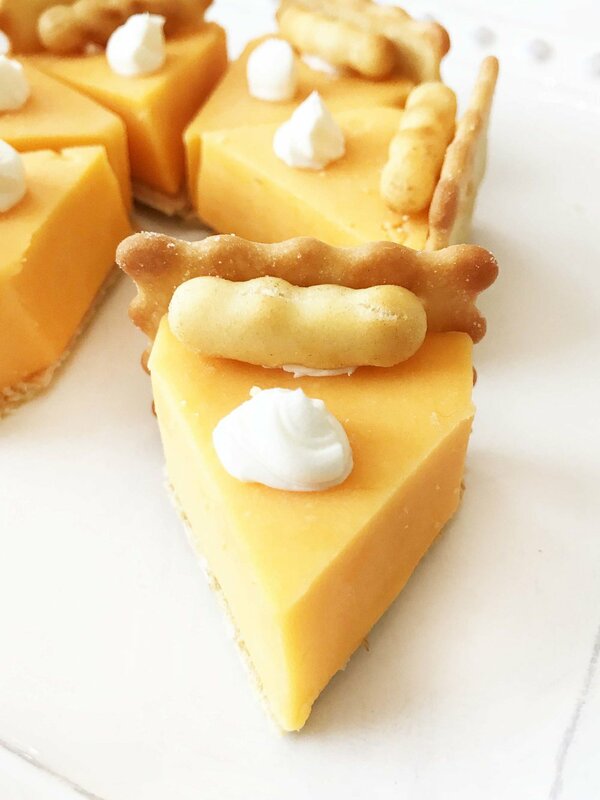 These cute little cheese and cracker bites are made to look like a little slice of pumpkin pie and are sure to impress your friends and family with how unique they are. They actually hold up pretty well with a softened cream cheese being used as the 'glue' that holds it all together. I started these off with a triangle shaped cracker on the bottom and piled on a nice big bite of reduced fat cheese. Then I added on the back crust and the top 'edge, followed by a dollop of cream cheese that looks like whipped cream on top of your little pie bites! These sweet little party appetizers don't need toothpicks either as they are pretty sturdy and stay together surprisingly well. I think I'm definitely going to have to make these again for Turkey Day this year. Can you tell that I'm party trained? I even made these a couple of hours before serving them, keeping them in an airtight container in the fridge until ready to serve. Of course, being cheese - you won't want to leave them out for hours on end. If you can't find the same exact crackers, don't worry! Just find similar ones to give you the same basic look, and stick with the wavy edges for the top 'crust' design! Slice the cheddar cheese into pieces about 1" thick and cut the squares into triangles to fit atop the triangle crackers. Place the 1 Oz. softened cream cheese into a piping bag or a ziplock with the corner tip cut off for piping. This will serve as the 'glue' to hold these pie slices together. Pipe a small amount of cream cheese onto one side of the triangle shaped cracker and place the cheese wedge atop. Next, pipe a small amount of cream cheese onto one side of the large wavy cracker and 'glue' it to the short side of the triangle wedge. And finally, put a small dab of cream cheese on the bread stick piece and place it along the top of the cheese and in against the edge of the wavy cracker to make your edging for your 'pie crust'. If you're feeling extra fun, add another dab of cream cheese to the top of the 'pumpkin pie' slices to look like the whipped cream!